To dine at the 21 Club is to be a consumer of history first and calories second. Before it became a Midtown mainstay of the rich and powerful, it originated as a humble Greenwich Village speakeasy known as the Red Head. During the Prohibition era, the speakeasy’s original owners changed the name and location several times with each new iteration becoming progressively more upscale and exclusive. By 1929, the year when 21 opened at its current address, it had already built quite the reputation. 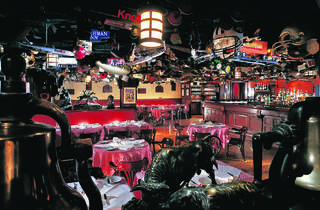 For a meal in the famous Bar Room you’re encouraged to “follow in the footsteps of movie stars, presidents, captains of industry and sporting legends.” Here, one can sit in the same booths that welcomed the hallowed derrières of names like Roosevelt, Vanderbilt, Hemingway and Sinatra. 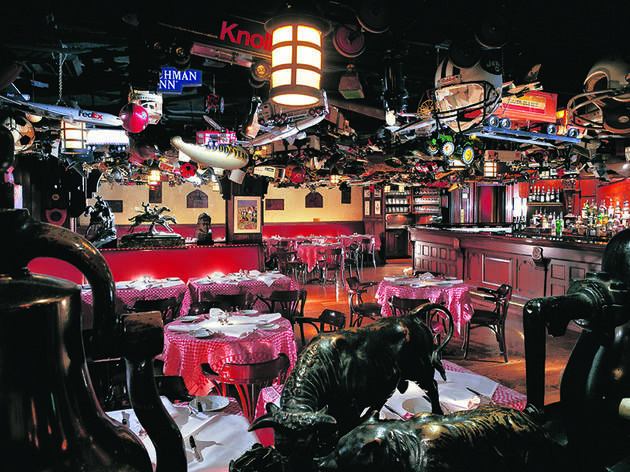 Suspended from the Bar Room’s ceiling are the iconic ‘toys’ of the 21 Club: gifts from notable patrons including miniature planes, cars and myriad sports memorabilia. It’s not a familiar vestige of fine dining, but it certainly does add character. Genteel waiters and captains serve with professional aplomb, offering menu guidance with the confidence of several decades experience. Though the formality that gentleman wear neckties was dropped several years ago, jackets are still required while jeans and sneakers are prohibited. Before the new age of fine dining flush with ingenuity and a drive for menu differentiation, there were ubiquitous staples that could be found at many of New York City’s top restaurants. If you crave a menu of a simpler time, 21 can accommodate, though at prices that would make less hefty corporate cards blush. If served the restaurant's well-executed Dover sole with lemon beurre blanc ($68) at an upscale wedding, you’d be thoroughly impressed—yet, the sticker price seems like an insider’s punch line. The 28-day dry-aged ribeye steak ($68) is served with a decadently buttery béarnaise, but take care when slathering it on the meat, which, while fairly seasoned, arrives a notch thinner and less unctuous than ribeyes at the city's top chophouses. Amid the novelties, like the playful pommes soufflé ($17) and theatrical baked Alaska ($14) there are newer menu additions by executive chef Sylvain Delpique (David Burke, Fishtail). The ethereal octopus carpaccio ($26) with tiny flecks of citrusy cara cara, tangy kalamata and delicate za’atar vinaigrette begs the question of what dining at 21 might be like were Delpique fully unbridled by old-hat traditionalism. By meal’s end, you may find yourself with the uncontrollable urge to cap the evening with a martini; don’t fight it. If ever there were occasion for such a drink, surely a trip to the 21 Club suffices. I love the 21 club. I have been here several times and service is on par, the ambiance is super cool, and food and drinks on point. Iconic NYC spot. I used the 21 club as my wedding reception venue. On the surface, everything seemed fine until it was time for the billing to happen. They let someone not invited to my wedding inside the venue. They never sent me a bill, I had to ask for it via email. I then noticed I was overcharged for the plates. They billed my credit card, and after I submit payments, all the charges were dropped, only for them to re-bill me two months later. After many phone calls and conversations with my credit card company and the 21 club, I learned that their sales and billing manager had quit and no one bothered to call and tell me that the account was left open and my bill was outstanding. I got a pathetic apology, and they offered to send me a gift card. No gift card ever arrived. I will not go back. They can keep their gift card. Definitely has a curated, iconic like status with a certain ("old school") midtown crowd. A strictly enforced dress code helps maintain the airs, and the storied atmosphere ("wall clutter") helps relate the purpose and elegance of its design. The food is really tasty, classic American staples, and the staff is well trained and accommodating. It is certainly a bit pricey, but overall is a pretty good experience.